Children! 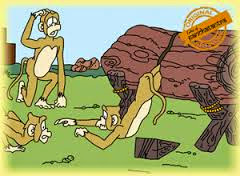 one more interesting story from Panchatantra for you and you can learn a great moral from this story. Sure, you all have heard the story of a monkey who poked his nose into unnecessary affair met with his death. Though Panchatantra Stories are written in ancient times, yet these hold good even to these days and each short conveys a message to the mankind for a better living. Here goes the story of the monkey and the log of wood. Long long ago there lived a wise and wealthy merchant in a village. Once he intended to construct a temple for the welfare of the villagers and so employed many masons and carpenters for the construction work. All the workers were engaged in their work during the day and in the noon they used to take 30 minutes break and go to the town for having their lunch. During one such days, when all the workers were about to leave for lunch, a carpenter who was cutting a log of wood, placed a piece of wedge in the partly-cut log before he left for lunch. He placed the wedge between the partly cut log so that the half cut pieces do not close up and it would be easier for him to continue with his cutting work after he returns. It so happened that there arrived a troop of monkeys after the workers left for lunch and you know, monkeys are too curious and keep handling and playing with the things around. So, these monkeys started playing with the things left around by the workers and one monkey which was too curious to know things, was attracted towards the wedge placed between the partly cut log of wood. Curious to know what it is, the monkey started mishandling and he tried pulling the wedge which was tightly placed between the partly cut log. As the wedge was tightly fixed, the monkey struggled pulling it and finally he succeeded in pulling out the wedge. But unfortunately, it so happened that the partly cut log of wood closed up and the monkey's legs were trapped in between the partly cut wood. The monkey screamed and yelled with pain. It tried hard to come out of the partly cut wood that was closed up but it could not succeed. 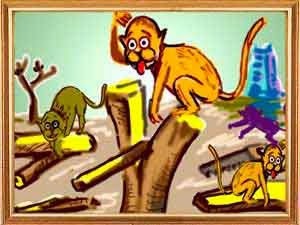 The other monkeys got terrified at the sight and ran to help their friend whose legs were caught up in the log of wood. The others monkeys too screamed and yelled and tried to help their friend to pull out but could not do so. And within a short time the monkey breathed his last. The other monkeys felt sad for the unexpected death of their friend and left the place with heavy hearts. Now the moral of the story goes like this: it is not wise on our part to poke our nose into unnecessary affairs. We need to be contended with whatever God has gifted us and we should not interfere into unnecessary matters. Instead, it is always better to stay away from unnecessary issues.